The global economy is expected to slow down this year after showing signs of robust growth in the last few years, but Asian emerging economies will remain resilient. Registering for the public talk at the main campus. 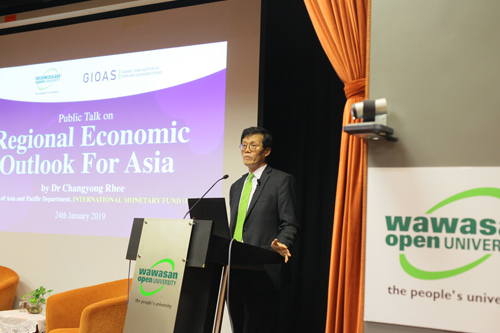 This was expressed by Dr Changyong Rhee, Director of Asia and Pacific Department, International Monetary Fund (IMF), during the public talk on “Regional Economic Outlook for Asia” organised by WOU’s George Town Institute of Open and Advanced Studies (GIOAS) held at the main campus today. Dr Rhee shares about the global and regional economic outlook. He said the IMF forecasts a slightly weaker global economic growth momentum, and so has revised down the expected global economic growth from last October by 0.2 percentage point to 3.5% for 2019. He noted that investor sentiments in financial markets are deteriorating because of concerns about downside risks. He elaborated on the key downside risks to the global economic outlook, namely an escalation of US-China trade tension and a further deterioration in risk sentiment amid less policy space for countries to react compared with the 2007 economic crisis. Highlighting the potential impact of the US-China trade tension escalation. Dr Rhee added that there are political elements in the US-China trade tension so it is hard to predict how it would evolve. He hoped that the trade tension will not escalate with additional US tariffs on China exports as global economic activity would slow further as it would not only raise direct trade costs but also affect confidence, thus reducing firm’s investment and raise firms’ cost of capital with negative impact on financial markets. He said although there could be trade diversion with the US buying products from Malaysia and other ASEAN countries, there are no winners as the trade tension escalation will impact the general confidence in the financial market and cause a slowdown in overall economic activity. Dr Rhee with Tan Sri Andrew Sheng (left) during the Q&A session. He noted that China’s growth forecast for 2019 had already been revised downward by 0.2 percentage points to 6.2% last October, partly because of the negative effects of tariff increases enacted in the U.S. and China in early 2018. He said, while fiscal stimulus packages would help to partially offset some of the impact of the trade tension, this may cause more instability in the medium term given already very high leverage in the system. Dr Rhee emphasised that there are no winners in the trade war and countries should resolve cooperatively and quickly their trade disagreements and the resulting policy uncertainty, rather than raising harmful barriers further and destabilising an already slowing global economy. Clarifying that there are no winners in the trade war. The second downside risk to the global economic outlook, he stated, is tighter global financial conditions despite the slow pace of US monetary policy normalisation. Tan Sri Dr Koh Tsu Koon presents a token of appreciation to Dr Rhee. He said the third risk is that there is less policy space and resources for many emerging market economies to cope with another slowdown of the global economy compared to 2007, as they had already used their fiscal and monetary resources and dropped the interest rate significantly in coping with the last global financial crisis. “That is why we ask policy leaders to be reasonable and to resolve this issue in a more harmonious way,” Dr Rhee concluded. Thai Consul-General General Mr Raschada Jiwalai (2nd from right) chats with Dr Rhee and the other VIPs before the talk.